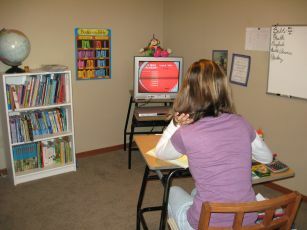 In her search for a homeschool program, Jamie found Abeka’s home school video curriculum. There had always been something missing in other programs, but this was exactly what she was looking for. Here's Alexa in her schoolroom. Jamie’s girls (Alexa, Alysa, and Aleah) are presently in 8th, 5th, and 3rd grade, respectively. The thought of teaching three grades at once simply overwhelmed her. She wanted the best for her children, and she did not feel capable of doing that alone. Abeka’s DVD home school program provided her with the tools to make the best possible. They are using Program 1 of the DVD Option because it provides transcripts that are necessary for college admission. The DVDs are rented on a nine-week basis, which allows you to keep them for a quarter of the school year. Every subject is covered and parallels the content in the textbooks. Don’t worry if one of the children should get sick and fall behind. They have a two-week grace period built into the system. Abeka supplies you with a box for easy returns. You will want to return them in a timely manner or pay a penalty. That’s a great incentive to remain on track! Jamie likes that as it keeps her accountable. A $200 credit is applied to next year’s curriculum when DVDs are returned on time. I had the opportunity to watch Aleah during her spelling lesson. It was interesting to watch as she stood by her desk reciting right along with her fellow students on the DVD. If you are contemplating using a DVD home school program, you will want to seriously consider using Abeka’s Homeschool DVD program. It has everything you need to successfully teach any number of children.